Keep Your Boat Clean with a Good Coat of Polish all the Time. Leaving your boat dirty allows dirt and grit to be ground into the gel coat and allows the sun and ultra-violet light to dull and fade your boat allowing it to become oxidized and 'chalky'. Use only Marine Cleaners and Soap. Do not use household cleaners and detergents. "Dish Soap" is designed to 'cut through grease' and oil, which means it will quickly remove the wax and polish you just put on your boat. Also, household scouring detergents such as soft scrub (and the like) will not only clean the stain away but will scratch into the gel coat and thereby clean the shine away too after a couple of uses. There are marine soaps and detergents that are designed for boats that will not strip the wax or scratch the gel coat. Use only Plexi-Glass Cleaners on your Plexi-Glass Doors, Hatches and Windows. Using glass cleaners will scratch and cloud the plexi-glass. The same goes for the plastic curtains. There are cleaners specifically formulated for them that will not scratch or cloud them. Use Fabric Fender Covers and Keep Fenders Clean. These are not just for appearance. 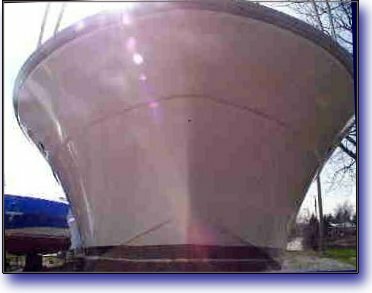 They are soft and as such will not scratch the gel coat of the boat as a bare-fender will do. Also keeping them clean will prevent dirt and grit from being ground into the gel coat. Wear Only Boat Shoes on Your Boat. The soles of non-boat shoes are harder and thus will scratch and leave marks on the gel coat (especially if the soles are colored). keep the buffer moving so as not to heat up and burn the Gel Coat. do not turn buffer on edge as the edges can cut into the Gel Coat. do striped and painted areas by hand, as the polisher can damage the striping or paint. watch out for objects on the deck such as attenna wires and plastic objects as the buffer can catch them causing damage. Use Only Non-Detergent Soaps on Canvas. Your boat canvas is treated with water and mildew resistent conditioners. Using detergent soaps will work to remove those conditioners thereby shortening the life of your boat's canvas. Do Not Over-Fill Gas Tank. Be cautious when filling your boat's gas tanks so as NOT to rely on the over-spill valves. Injecting gasoline into the water is not only a fire hazard and bad for the environment it is also removes the wax as it runs down your hull and deteriorates the striping (whether it be painted or vinyl striping). Many gas dock attendants will do this, please advise them not to on your boat! These are just a few tips for maintaining that showroom shine while JBW is away.